Is Your Pet Door Secure? Pet doors are one of the greatest inventions of all time for pet owners. Instead of worrying about rushing home after work to let your dog out, or getting up early on a weekend to give him access to the backyard, you can rest easy knowing your dog's own special door will allow him to come and go as he needs. Of course nothing is perfect. The downside of pet doors can be worries about security. If your dog can get in and out of a pet door, then can't a burglar do that too? Although it is possible for a human to fit through some large pet doors, you can do a lot to make your dog door--and your home--more secure. When shopping for a doggy door, keep in mind certain features that can make it harder for someone to use the door to break into you home. Here are some tips for purchasing a secure dog door. When selecting a pet door, buy the smallest one your dog or cat will fit through. The smaller the door, the harder it is for a human to squeeze through. Measure your dog from the floor to the top of his head to have an idea of how large the opening should be on the door. Consider a pet door that has a locking mechanism that responds to a sensor attached to your dog's collar. When your dog approaches the door, it opens to allow him to pass through. The door then locks itself. 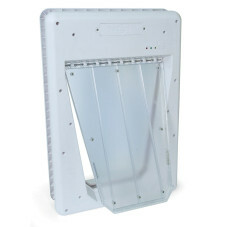 This type of electronic doggy door also works to keep cats inside and critters like raccoons and possums out. Think about getting a pet door that installs into a wall in your house instead of onto a door. Wall-installed doors are more secure than dog doors installed into a door, and are harder to crawl though. Lock your pet door securely during the day since that is when most burglars are active. The majority of break-ins occur during the day when people are away at work. In addition to buying a secure pet door, you can make your home more secure in other ways. To reinforce safety features of your dog door, consider taking these measures. Equip your home with alarm-based security system, preferably one with a motion sensor. If you buy a system designed for homes with pets, the sensor will be "pet safe," meaning your dog won't set off the alarm when he moves through the house. Buy a system that is rated for your dog's size. Consider downloading an app that will receive an alert on your smartphone or tablet whenever your pet door is activated. The Honeywell Security Group Total Connect app is one such program. You can also set up a camera to live-stream pet door activity to your device. Put secure locks on your property gates to make it harder for would-be thieves to get to the back of your house where they can access the pet door. Be sure to lock the gates at night and whenever your not home. 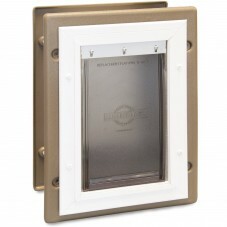 Install motion sensor lights around the pet door and other doors in your home. Automatic lights are a big deterrent to criminals, as well as wildlife that might decide to enter your house through the dog door. Don't forget that your dog is a deterrent too. Even if he's small, his presence and his barking is likely to scare off an intruder.